For every EUR 100,00 you lose at the Interwetten Online Casino, you get EUR 10,00 back. This promotion is valid to all Interwetten Casino Real Money customers. This promotion is subject to Interwetten Casino standard rules, terms and conditions. To qualify for the cashback bonus you must make a transfer of funds from your Sportsbook real money account in to Casino chips and wager at least EUR 100,00 on the respective promotion day at Interwetten Online Casino. For each EUR 100,00 loss at the Interwetten Online Casino, the customer will get EUR 10,00 Chips credited to his Interwetten Casino account. The bonus will be credited to the customers account on one of the following days. There are no wager requirements for the Cashback Bonus. Interwetten Casino reserves the right to refuse all promotions and bonuses to players who do not comply with this condition. Interwetten may cancel, terminate, modify or suspend the promotion or these terms and conditions at any point and for any reason, including for technical reasons such as and not limited to computer viruses, bugs, tampering or technical failures. We will remove prize credits from the account of any member who fails to comply with any of the above conditions. Management decision is final. No discussion will be entered into. The terms are quite unusual, as they state that for each €100 loss they would refund €10, or 10%. Cashbacks are usually based on net losses for the day, but this looked different. I had no idea if the text was a misrepresentation of the deal, so I decided to check it out on the second Sunday and see what was what. By the end of play I had racked up winnings of over £5000 ($10,000), at which point I transferred my total balance of over £6000 back to the sportsbook and logged out. Next day, my account was locked. Due to a technical problem, an erroneous bonus payment was issued in the Casino on February 10th, 2008. The bonus was wrongly issued after each Casino transaction and then credited to your bonus balance, not on the following day as it is specified in the terms and conditions. Furthermore, bonus credit was able to be generated through the bonus itself, which is ruled out by the bonus regulations. In your case, all casino transactions starting from Feburary 10th, 2008, 00:00 a.m., had to be voided. This includes the refund of all real money losses, instead of only 10% of the real money losses, plus the cancellation of the complete erroneously created bonus. We want to point out that there is no disadvantage to your account, as not 10 % as stated in the bonus offer, but the complete amount of losses has been refunded. There are a number of problems with this course of action. This was what was stated, and this was what happened. There was no discrepancy, mistake or error in the performance of the software in relation to the given terms. Whether or not it should have been issued immediately, tomorrow, next week or next month, €10 for €100 lost does not change. The timing of the rebate is immaterial to the amount – I would still be owed €10 for each €100 lost as per the terms. The only material difference would be that with the bonuses being credited immediately there was less liklehood of having to redeposit, but still this does not affect in any way the amount owed, €10 for each €100 lost. The bonus credits being, at the point of their posting into my balance, my money and NOT bonuses, then what I do with them is my business. I can win, lose, or simply withdraw. They are my money. They are NOT bonuses. They are therefore not subject to bonus regulations. Chartwell bonuses are almost always issued post-wager, ie. after you've completed whatever terms are associated with the bonus. They are not posted direct to your balance. Sometimes they ARE, however, and when you wager with a Chartwell bonus credited BEFORE the requirements are met (ie, upon deposit / transfer), any wagers you make with the bonus itself do not qualify for the bonus terms, because they are not your money yet. 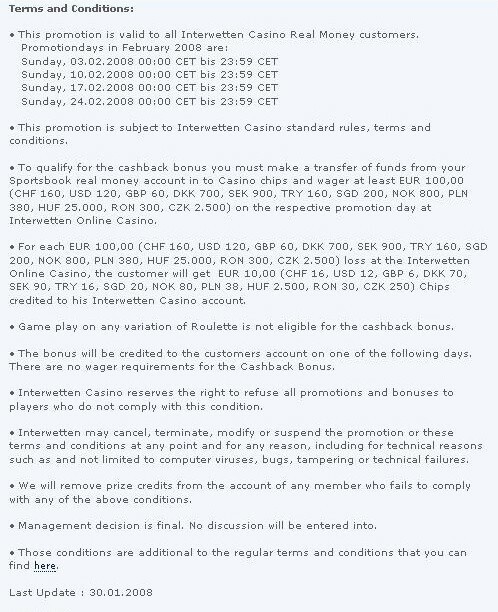 However, these bonuses, generated during the Interwetten cashback promotion, had no terms attached to them. As soon as they appeared as a part of the 10% rebate, they were mine as basically fully cleared and earned as per the terms - the 'condition' for their receipt was simply to lose €100. As such, they are no longer 'non-withdrawable bonuses'. My money is my money, as is the case with any bonus whose requirements have been successfully completed, and money which is no longer anything but mine is not bound by terms relating to other types of casino money, ie. unreleased bonuses. 4) The casino uses phrases like 'technical error', 'false amounts' and 'erroneously created', all of which is fair enough: if they made mistakes, if they set things up in a way which, in retrospect, they wish they hadn't, that's all well and good. We all make mistakes occasionally; I've made a few 'errors' of my own which have cost me money. However, it's my responsibility to pay for them when I make them, not someone else's. If Interwetten made 'technical errors', then it's their job to accept responsibility for them also. There should not be one rule for the players and one for the casino on the basis of the casino having the money and being in a position of strength as such. That is unfair and very anti-consumer, and is also in contravention of the 'Unfair Terms' laws of Malta. We want to point out that there is no disadvantage to your account. This is an absurd claim. They have confiscated over £5000 of my money. I consider this a great disadvantage, as I'm sure anyone would. I have been looking at aspects of Maltese consumer law: here is the Malta Consumer Affairs Act of 1996. 44. 1. It shall be unlawful in consumer contracts to use unfair terms, or terms or combination of terms which are unfair in that they have as an object or effect any of the objects and effects referred to in subarticle (2), and any term prohibited as aforesaid inserted in any consumer contract shall be deemed never to have been so inserted. a) excluding or limiting the liability of a trader by reason of his own fraud or gross negligence or that of his employees or agents, or by reason of any failure to fulfil an obligation constituting one of the fundamental elements of the contract. Interwetten says there was an 'obvious technical failure', but according to the Maltese law above, Interwetten's negligence or failure does not limit its liability. If they made a mistake, then I cannot be reasonably punished for it. The responsibility lies with Interwetten and not with the customer. The text is categoric. There is no mention of a 'net overall loss', the text says that EUR 10 will be credited for each EUR 100 lost. 47. 2) Where any term is ambivalent or any doubt arises about the meaning of a term, the interpretation most favourable to the consumer shall prevail. As such, if there were any doubt about the exact nature of the cashback deal on the basis of the wording of the terms, then an interpretation that favours the player must prevail. That interpretation being exactly what happened whilst playing (€10 credited for each €100 lost), I do not see that there is any room for another interpretation. So when Interwetten not only 'suspended the promotion', but in fact suspended it retrospectively, after all play had been completed, then that term's application gives rise to an extraordinary imbalance to the consumer's detriment. Interwetten may suspend anything and everything they want to, but they must not do this after the fact and so place the customer at an extreme disadvantage. They must treat me fairly first, and pay what is owed. Then they may suspend at will. 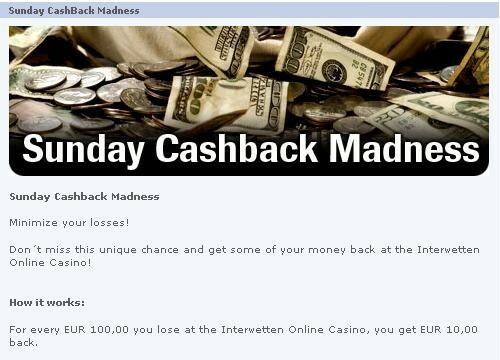 In summary: Interwetten offered a cashback promotion in which I participated and which performed exactly as was described in the terms and conditions. They then changed their minds after the fact, claimed a 'mistake' and voided my winnings in excess of £5000. Aside from being grossly irresponsible business practice, Interwetten would appear to be in contravention of Maltese law in so behaving. I posted about this matter at Winneronline, in the Interwetten: substantial winnings confiscation issue, and a week or so later a thread appeared at Casinomeister, Interwetten confiscating winnings, so there are clearly other players who were caught up in this. I have now complained formally to the Malta Lotteries And Gaming Authority, by whom Interwetten is licensed. Looks to me like Malta will have no choice but to rule against the casino in this instance.